Joseph Leynard Smith (born July 26, 1975) is an American former professional basketball player who played at power forward position for 12 teams of the NBA during his 16-year career. Smith attended Maury High School and played at the University of Maryland. In the 1995 NBA draft, Smith was selected by the Golden State Warriors as the first overall pick, before fellow power forwards Kevin Garnett, Antonio McDyess and Rasheed Wallace, as well as guard Jerry Stackhouse. Smith was named to the NBA All-Rookie First Team for the 1995–96 season and finished second in the Rookie of the Year voting to Damon Stoudamire. 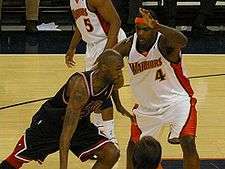 Joe Smith would play two-and-a-half years for the Warriors before being traded to the Philadelphia 76ers with Brian Shaw for Clarence Weatherspoon and Jim Jackson midway through the 1997–98 season. The trade was engineered by Golden State as Smith had made clear his desire to return to the east coast, and he was approaching free agency (halfway through the final year of his 3-year rookie contract). Smith's statistics declined immediately after the trade, and never fully recovered. Despite a drop in production, Smith was seen still as a hot commodity in the free agency blitz that followed the strike in late 1998. In what seemed at the time like a bizarre move, Smith signed for very little money with the Minnesota Timberwolves. For the next two years, Smith played very productively at small forward alongside All-Star Kevin Garnett. Following the 1999–2000 season, it was discovered that Smith was involved in a salary cap–tampering scandal involving Timberwolves executive Kevin McHale. Smith was allegedly promised a future multimillion-dollar deal if he signed with the team for below market value, allowing the team to make some additional player moves in the short term. The league later found out about this violation and voided the last year of the contract, also severely punishing the Timberwolves by taking away five first-round draft picks (though two of the picks were ultimately returned) and fining the team $3.5 million. The move hurt the Timberwolves in the long run, as while the team still found success, the lack of draft picks set the team up for their eventual failure in the mid-2000s, which would continue well into the 2010s. Joe Smith was released by the Timberwolves and signed with the Detroit Pistons for the 2000–2001 season as a backup. Smith produced good numbers for the Pistons and, at the end of the season, he re-signed with the Timberwolves where he played for two more seasons. For the next three seasons Smith played for the Milwaukee Bucks. Prior to the 2006–07 season, Smith moved on to the Nuggets, where he only played in 11 games before being traded, along with Andre Miller, back to the 76ers for Allen Iverson. Despite being considered an add-in on the deal, Smith averaged over 25 minutes per game with the 76ers, during the team's ultimately unsuccessful second half battle to make the playoffs. For the 2007–08 season, Smith signed with the Chicago Bulls. Smith averaged over 11 points and 5 rebounds per game for the Bulls, but the team managed only 33 wins the whole season. Smith was traded in a three team deal at the trade deadline to the Cleveland Cavaliers. 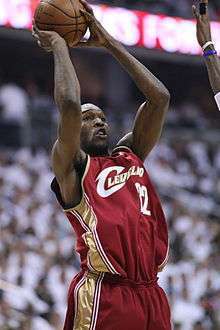 On August 13, 2008, Smith was traded to the Oklahoma City Thunder in a three-team, six-player deal involving the Thunder, the Milwaukee Bucks, and the Cleveland Cavaliers that sent Milwaukee's Mo Williams to Cleveland, Smith and Milwaukee's Desmond Mason to Oklahoma City, and Cleveland's Damon Jones and Oklahoma City's Luke Ridnour and Adrian Griffin to Milwaukee. The Thunder traded Smith to the New Orleans Hornets along with Chris Wilcox and draft rights to Devon Hardin on February 17, 2009 for Tyson Chandler but on February 18, 2009 the trade was rescinded after Tyson Chandler failed a physical with Oklahoma City. On March 1, 2009, the Thunder bought out the remainder of Smith's contract and released him. Two nights later, he agreed to terms to rejoin the Cavaliers. On August 25, 2009, he signed a one-year contract with the Atlanta Hawks. On March 17, 2010, Smith became the 92nd player in NBA history to reach 1000 games played, in a victory over the New Jersey Nets. On September 10, 2010, Smith signed a deal with the New Jersey Nets. On December 15, 2010, Smith was traded to the Los Angeles Lakers in a three team trade involving the Nets and Houston Rockets. On January 2, 2011, Smith made his debut for the Lakers. Two days later, he scored his first points as a member of the team. Smith wound up participating in one of the Phoenix Suns' pre-draft practices on June 9, 2015 as someone to help out center Alex Len during practice. He was initially considered a candidate to take on one of the Suns' player development coaching roles, but he was ultimately not hired for the position. Was named to the All-Rookie First Team in 1995–96 after being chosen first overall in the 1995 NBA Draft. In 1995, was named National Collegiate Player of the Year by the Atlanta Tip-Off Club (Naismith Award), the Associated Press (Adolph Rupp Award), United Press International, Basketball America and Eastern Basketball. Portrayed Connie Hawkins in the movie Rebound. He shares the record (with Chucky Brown, Tony Massenburg and Jim Jackson) for the most franchises played for in an NBA career. He played for 12 out of 30 franchises in the NBA. Smith has recorded a solo rap album under the pseudonym "Joe Beast". Included on the album are tracks titled "Murda Kapital" and "I Does This". ↑ "Joe Smith (biography)". NBA Media Ventures. 2009. Archived from the original on March 3, 2011. ↑ Most traded NBA players include: Joe Smith, Chucky Brown, Tony Massenburg and Jim Jackson. "Most Franchises Played For". basketball-reference.com. Archived from the original on April 10, 2014. ↑ "Bulls sign veteran forward Joe Smith". July 19, 2007. Archived from the original on June 30, 2007. ↑ DeMocker, Michael (February 17, 2009). "New Orleans Hornets trade Tyson Chandler to Oklahoma City". The Times-Picayune. NOLA.com. Archived from the original on July 3, 2014. ↑ Smith, Sekou (August 26, 2009). "Atlanta Hawks sign Joe Smith". Atlanta Journal Constitution. Archived from the original on July 3, 2014. ↑ "Nets Sign Veteran Forward". The New York Times. Associated Press. September 11, 2010. Archived from the original on July 3, 2014. ↑ "Lakers acquire joe smith in three-team trade". NBA.com. December 15, 2010. Retrieved December 15, 2010. ↑ Stephenson, Colin (December 15, 2010). "Nets make three-way Terrence Williams deal official". The Star-Ledger. Retrieved May 23, 2011. ↑ Steele, David (November 20, 1996). "Smith Plays Hawkins In HBO Movie". Sun Sentinel. Archived from the original on July 3, 2014. ↑ "Most Franchises Played For". basketball-reference.com. Retrieved December 10, 2010. ↑ Turner, Jamie (April 20, 2009). "Sing it out: Cavaliers' Joe Smith pushing for an NBA title, and for rap music success, too". The Plain Dealer. Retrieved December 29, 2010. Wikimedia Commons has media related to Joe Smith (basketball).